Just a little more than an hour's drive from the Inn lies Mt. 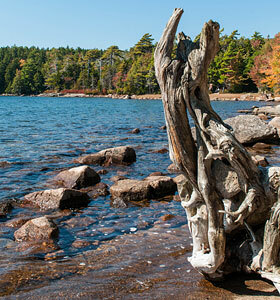 Desert Island, home to Acadia National Park and the well-known summer resort of Bar Harbor. 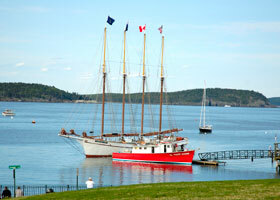 Bar Harbor Tourism Info 207-288-5103 -- As with Acadia, the town of Bar Harbor is covered extensively in printed literature so we won't go into great detail, but we hope that you'll enjoy a visit there. Bar Harbor is much larger and more commercial than Castine. Among its many shops, there are some quality galleries and craft shops; and plenty of restaurants if you find yourself there at lunchtime. At the harbor you can find excursion boats, sail or power, that tour the harbor and Frenchman Bay or whale-watching boats that venture further out for the thrill of seeing migrating whales. Whatever your interests, you'll find something appealing in Bar Harbor -- but be forewarned, in peak season the town is very busy so driving and parking may be a challenge. Mt. 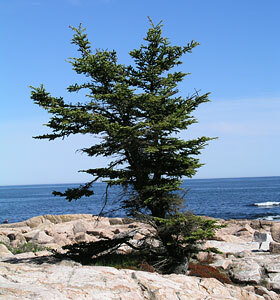 Desert Island -- Beyond Acadia and Bar Harbor, the rest of Mt. Desert is equally worthy of exploration. At Northeast Harbor, you can stop at the waterfront where the marina is home base for many visiting yachtsmen cruising the area in spectacular style; tour Thuya Gardens and the nearby Asticou Azalea Gardens 207-276-3727; follow Sargent Drive along Somes Sound for views across this country's only true fjord and a glimpse of some of the summer “cottages” for which the island is famous. Stop by the Oceanarium in Southwest Harbor 207-244-7330 where you can study the life of a lobster and touch a live starfish. (Open mid-May - late Oct., Mon. - Sat. 9 A.M. - 5 P.M.) Take the scenic route along the shore to Bass Harbor, a charming fishing village, and then follow Route 102 along the west side of the island, through the village of Seal Harbor and back to Route 3 at Somesville.